This was one of those times with no-one bidding against me on an eBay bid. 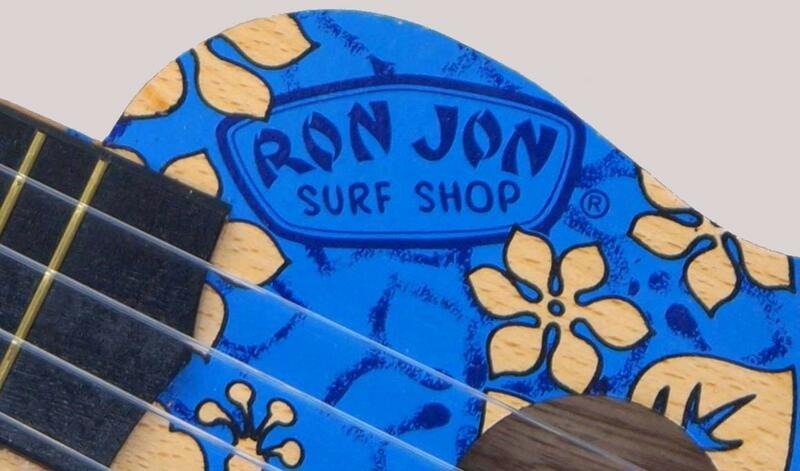 In this case it was a Ron Jon Surf Shop Soprano with a VERY low starting price, (I believe they are small Sopranos but I will have to check when it gets here). Now I know these are suppose to be very crappy tourist trash but they are very colourful and I have always kind of liked them: after all it's not the first time I have invited tourist trash to Ukulele Corner, (Its not the first time I have tried to invite a Ron Jon to Ukulele Corner but I don't usually try very hard and get outbid). The Ron Jon is here now and it is a Soprano and very colourful, but as I suspected, not very high quality. Still it is better than some of the tourist affairs that live at Ukulele Corner and does function perfectly well even it the action is a bit high and it doesn't sound that great The tuners work and hold fine, the intonation is ok and the bridge is both solid and actually quite good. Speaking of quite good, the other thing that has impressed me about this Ukulele is the quality of the decoration on the soundboard! It is spot on and far better than the decoration on some more expensive models.